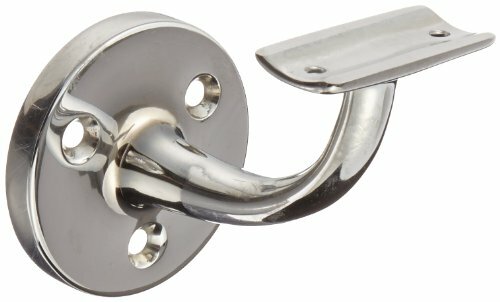 The Rockwood 702.26 cast brass hand rail bracket has a polished chrome plated finish (Rockwood/BHSM number US26/625) and is used to attach a wood hand rail to a wall. The base plate has a diameter of 2-13/16" and the bracket has a projection of 3-1/2" to the rail centerline. The bracket includes three #12 x 2" flathead wood screws and two #8 x 3/4" oval head sheet metal screws. If you have any questions about this product by Rockwood, contact us by completing and submitting the form below. If you are looking for a specif part number, please include it with your message.